As part of the Christian Lenten tradition, people abstain from eating “meat” on Fridays and instead consume seafood. Abstinence laws say meat is considered something that comes only from animals that live on land, like chicken, cows, sheep or pigs. Fish are a different category of animal. Salt and freshwater species of fish, amphibians, reptiles, (cold-blooded animals) and shellfish are permitted. Serving seafood during Lent means big money for restaurants who offer seafood specials on Fridays during those 40 days can increase seafood sales by up to 20 percent. Thinking fish for dinner? 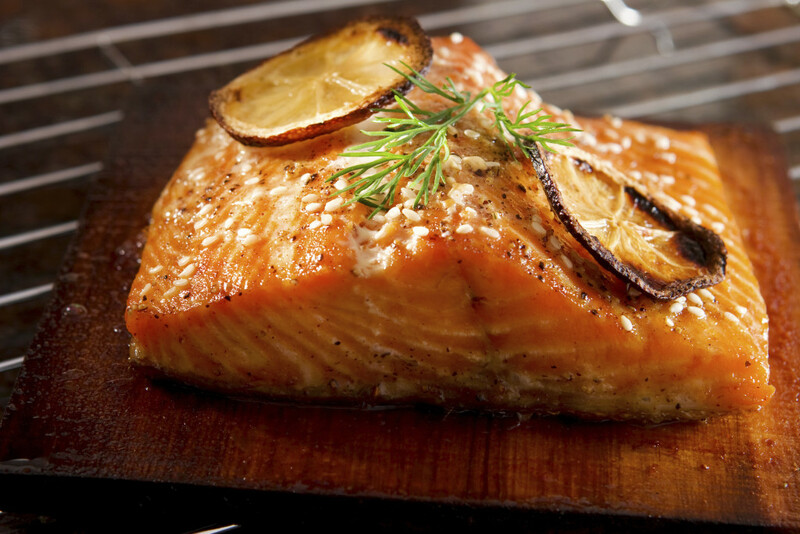 Remember seafood should be cooked to an internal temperature of 145ºF. If you don’t have a food thermometer, the flesh should be opaque & separate easily with a fork when done. Some people are afraid of cooking seafood because of the food safety aspects. Follow simple food safety tips so you can confidently select, store, prepare and cook seafood safely! Maintaining a safe seafood product requires caring for the product from the time it is caught until it is consumed; that responsibility doesn’t end at the point of sale. Local, state and federal food safety regulations require that fishermen – just like others in the seafood supply chain – be aware of and use proper handling and storage practices to ensure a safe product. Where is it from? (Domestic or imported – try to choose domestic). Is it farmed or wild? (Try to choose wild, unless it is sustainably farmed in the US). Is it caught or farmed locally? (Try to choose local foods over those shipped from far away). How is it caught? (Ask if the method has high bycatch or habitat damage). How is it farmed? (If you are buying farmed fish, when available, buy seafood raised in the U.S. in recirculating systems. Tilapia, shrimp, bass, trout and arctic char are examples of fish that are being farm-raised this way). Is it associated with any contaminants? (Mercury, PCBs, antibiotics, etc). Learn what are the good choices you can make when it comes to seafood, and why you should make them. 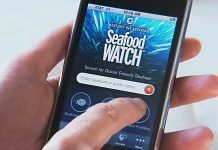 This video from Monterey Bay Aquarium’s Seafood Watch program highlights why such questions are important and how you can help protect the ocean just by asking your local grocery store or restaurant if they serve sustainable seafood. 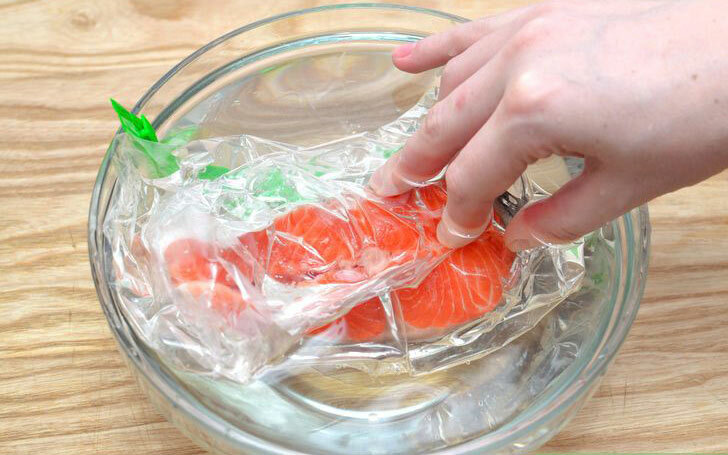 After shopping, immediately store commercially wrapped frozen seafood in your freezer. Put it in the coldest part of the freezer, at a temperature as close to –20 degrees F as possible. As with other frozen foods, avoid prolonged storage by planning your purchases, keeping in mind “first in, first out.” Commercially frozen seafood can be stored in the freezer for up to six months. Plan ahead; defrost fish overnight in the refrigerator. This is the best way to thaw fish to minimize loss of moisture. A one-pound package will defrost within twenty-four hours. 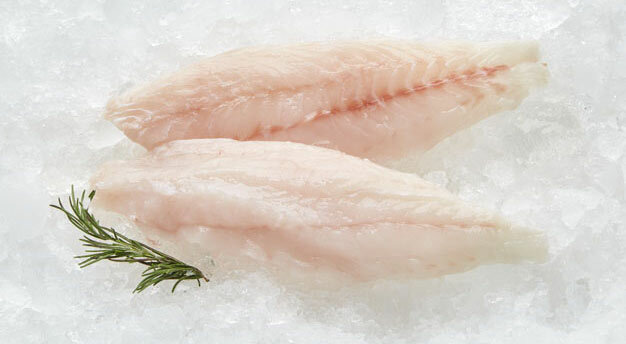 Never defrost seafood at room temperature or with hot or warm water as bacteria on the surface will begin to multiply. If you forget to take the seafood out of the freezer in time, place it in the sink (still in the package) under cold, running water. A one-pound package will defrost in about an hour. You can use your microwave oven to partially defrost fish. Use the lowest defrost setting (10% to 30% power). A pound of fillets defrosts in five to six minutes. The fish should feel cool, pliable, and slightly icy. Be careful not to overheat it and begin the cooking process. Foods defrosted in the microwave oven should be cooked immediately after thawing. Cleanliness. Be sure all surfaces and utensils that will touch the food are clean. Always wash your hands with soap and warm water for at least twenty seconds before starting food preparation, before working with a new food or utensil, after finishing food preparation, before serving, and after going to the bathroom. Wash cutting board, utensils, counter, sink, and hands with hot, soapy water immediately after preparing raw seafood, meat, or poultry. Cross Contamination. Don’t let juices from raw seafood, meat, or poultry come into contact with other food. Marinades. Marinate seafood in the refrigerator in a glass or plastic container; avoid metal. Avoid cross-contaminating other foods by cleaning all utensils, bowls, or surfaces the marinade comes in contact with after it has been combined with raw seafood. Don’t save marinades that have been combined with raw seafood unless they are immediately cooked in a sauce. Bring the marinade to a rolling boil before adding other ingredients. Then cook the sauce to at least 160 degree F.
Fish and shellfish are an important part of a healthful diet. In fact, a well-balanced diet that includes a variety of fish and shellfish can contribute to heart health and children’s growth and development. But, as with any type of food, it’s important to handle seafood safely in order to reduce the risk of foodborne illness. 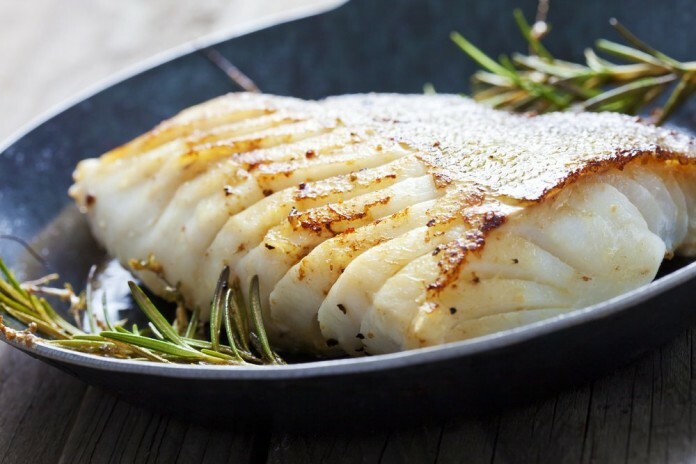 Seafood Safe Fact: The safe internal temperature for cooked fish is 145°F, or until the fish is opaque and flakes easily with a fork. 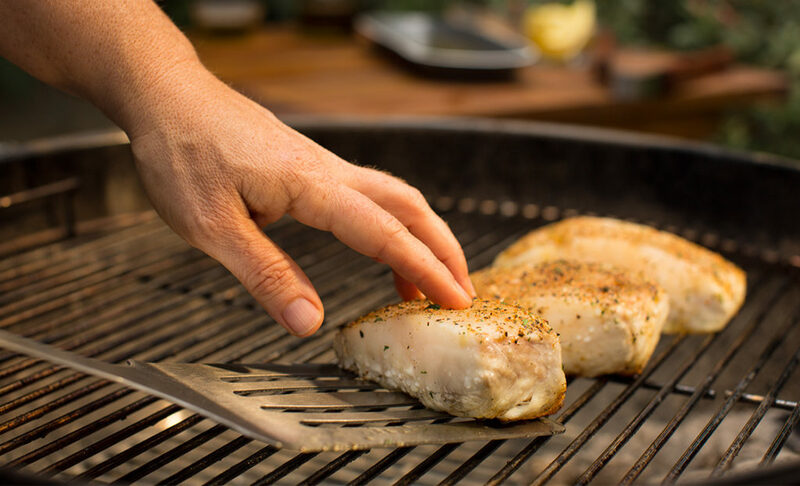 When cooking fish, cook it until the center reaches 145°F on an instant-read or meat thermometer. Another easy way to tell without even using a thermometer is cutting the piece of fish in the thickest part and looking at the texture. The fish should be opaque (not translucent like when it’s raw) and break easily into flakes when you nudge it with a fork. Never put cooked seafood back on the plate that held the raw product. Place leftovers in smaller containers and refrigerate them within two hours when the temperature of the food serving area is below 90 degrees F and within one hour when the air temperature is 90 degrees F or above. 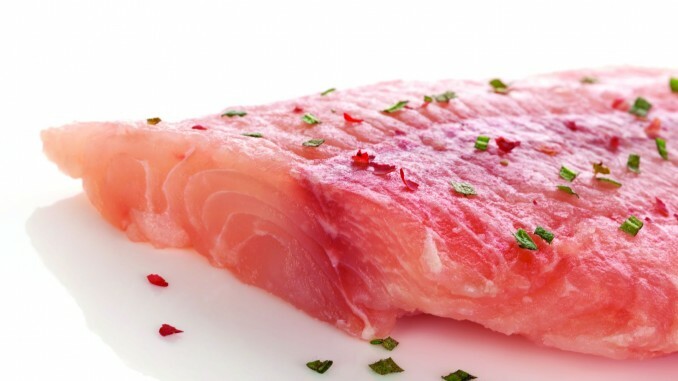 The FDA and EPA have issued advice regarding eating fish. 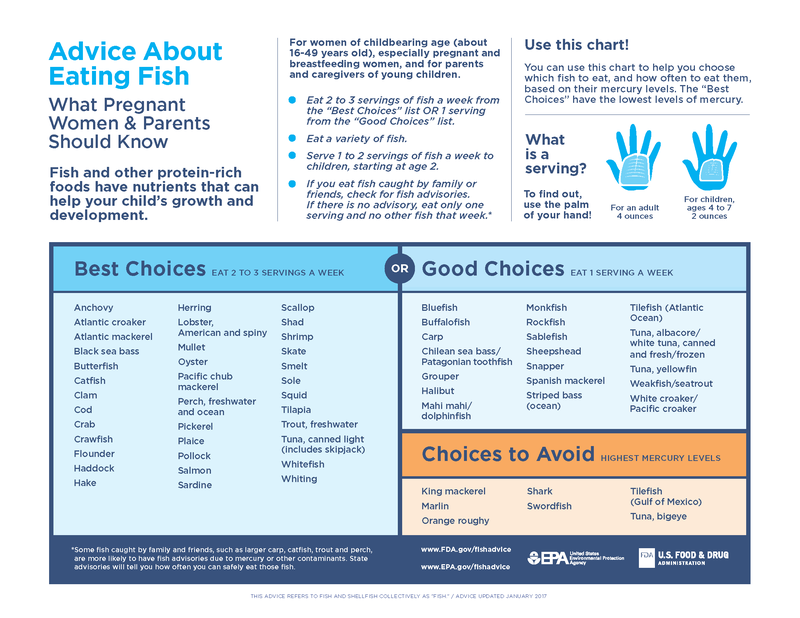 This advice is geared toward helping women who are pregnant or may become pregnant – as well as breastfeeding mothers and parents of young children – make informed choices when it comes to fish that is healthy and safe to eat. For women of childbearing age (about 16-49 years old), especially pregnant and breastfeeding women, and for parents and caregivers of young children. Eat 2 to 3 servings of fish a week from the “Best Choice” list OR 1 serving from the “Good Choice” list. Serve 1 to 2 servings of fish a week to children, starting at age 2. You can use this chart to help you choose which fish to eat, and how often to eat them, based on their mercury levels. The “Best Choice” have the lowest levels of mercury. NOAA Fisheries – NOAA Fisheries is responsible for the stewardship of the nation’s ocean resources and their habitat. Monterey Bay Aquarium – The Monterey Bay Aquarium’s Seafood Watch program helps consumers and businesses make choices for a healthy ocean. Mercury in Seafood – What You Need to Know About Mercury in Fish and Shellfish (FDA) – Advice for pregnant women (and those thinking about pregnancy), nursing mothers, and young children. 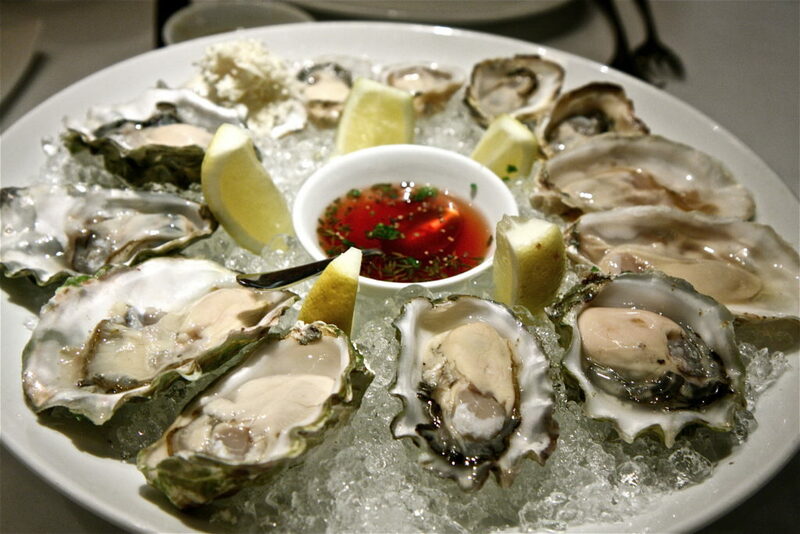 Risks of Eating Raw Oysters – Raw Oyster Myths (FDA) – Hot sauce does not kill harmful bacteria in raw oysters; neither does alcohol. Get the facts behind the myths. 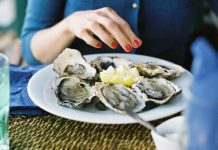 Raw Oysters Contaminated With Vibrio vulnificus Can Cause Illness and Death (FDA) – Explains the risks associated with eating raw oysters and how to prevent serious illness. 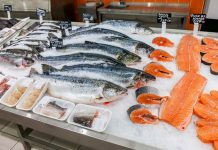 General Information on Seafood – Fresh and Frozen Seafood: Selecting and Serving it Safely (FDA) – How to handle seafood safely in order to reduce the risk of foodborne illness.